Friends, today is a very important day in gaming. You see today, a game called Doom is 25 years old. And that's something we need to celebrate. Because Doom, quite arguably, is the most important game ever made. Whatever you might think about Half-Life, Super Mario 64, or Big Rigs, whatever important innovations those games brought to the table, all of them, in turn, owe a debt to Doom. Because iD's Satanic FPS masterpiece set the scene for everything that came after it. Whether seen from a gameplay, tech, or even a cultural perspective, Doom is the foundation of all of modern gaming. There's barely a single key element of the modern industry or community for which Doom didn't set the wheels turning. So sit back, click on, and open a can of Robo Cola in tribute, as I take you through the most fundamental ways that an angry, lone marine and a pump-action shotgun shaped the way you play games today. There had been 3D (or at least pseudo-3D) games before Doom. But ye Gods, did iDs gloomy demon-evisceration simulator popularise the format like no previous title. At the time of its release, any monitor running Doom felt like a portal to an inconceivable sci-fi future of gaming so advanced that the game probably actually had a contemporary setting. Even compared to Wolfensteins 3D mazes, Dooms levels, with their newfound verticality, outdoor sections, dynamic lighting and twisting, organic design sent perceptions of what games could be spinning off down a flaming Hell-pit. While Wolfenstein had made 3D combat cool, Doom really showed off its real potential as a world-building tool. As such, believable 3D worlds became the long-term goal of pretty much all game development from that point on. This one is a no-brainer, but it still warrants a mention. FPS, especially over the last console generation, has become by far the dominant video game genre, with countless variants and approaches spinning out to utterly fill the gaming landscape. And while Doom wasnt the first FPS, again its vision of the kind of worlds and combat scenarios possible in a first-person perspective was fundamental in kickstarting that revolution. Simply, it was such an immersive, well-realised, utterly complete world that it all at once confounded players with its scope and ignited a powderkeg of inspiration regarding what might be possible. Where Wolfensteins take on the concept had provided a cool novelty, Doom made first-person shooting Very Serious Business Indeed. 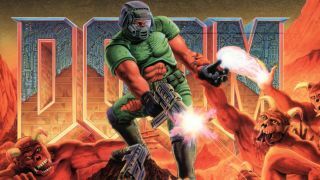 Its no coincidence that the early glut of follow-up FPS were labelled Doom-clones until the genre became so prolific as to demand its own, entirely independent monicker. As well as popularising FPS, Doom also introduced the action-horror hybrid to the masses. While the popular perception of Dooms core gameplay is (erroneously) one of rampant killing sprees and the merciless chaingunning of vast, frantic demonic hordes, the fact is that Doom was always a tad smarter and more unsettling than that. Between the ammo rationing, the dense, tendon-snappingly tense atmosphere, and the games oppressive lighting effects and outright malicious surprise monster-traps, Doom could be a flat-out terrifying experience at times. Of course, real survival horror would come later, in the form of Resident Evil and Silent Hill, but Doom introduced some of the genres main themes to the masses, while prophetically cementing the tropes of the action-horror hybrid that the survival horror genre would eventually transition into. The power and versatility of Dooms engine (retrospectively renamed iD Tech 1, to fall in line with the studios growing pantheon of industry-changing development tools) made it one of the first notable game engines to be licensed out to fuel another wave of FPS. Aside from the games overall brilliance, the ability to edit Dooms level data files has probably been the biggest factor in its popularity, at the time of its release and running right through to this very day. Not only did the immediate advent of player-created mod content (15 years before LittleBigPlanet pretended that it invented the stuff) give Dooms longevity the kind of legs usually only found on some sort of unholy frog/giraffe hybrid, but it also built one of the strongest, most creative early online communities centred on a video game. But while iDs open, connected relationship with its players and their ever-expanding bank of homemade content set the wheels in motion for many of supposedly more progressive ideas in modern gaming, it also spawned a great number of the developers responsible for running that modern industry. Countless level designers and programmers cut their teeth on amateur Doom mods (and even more got in on the act when the mod tools for iDs follow-up, Quake, became available), leading to the creation of a whole bunch of new studios. The modding culture that Doom built still permeates the fabric of the evolving games industry. Steam is now packed with free, fan-made engine mods. Some of the biggest games of the last few years (Day Z, for instance, and also Dear Esther and Gone Home) started out as exactly that. And the Oculus Rift is already a thriving platform, due almost entirely to the eclectic wealth of fan-made games available for it. Remember when Gears of War popularised online co-op by way of gloomy, gory, sci-fi shooting? Or rather, remember when Gears of War took the credit for popularising online co-op by way of gloomy, gory, sci-fi shooting? Yeah, one of the defining gameplay set-ups of the seventh generation was something that Doom did first in 1993. It just took console games 16 years to catch up. But then, to be fair to Gears, they were all doing it. And its the same for competitive multiplayer too. You know the term Deathmatch? That phrase was coined in an off-hand comment by John Carmack regarding Dooms competitive arena mode. Doom literally invented online deathmatches. If any one thing has typified the reveals of new triple-A action games at the last couple of E3s (2012 in particular), it has been the macabre game of one-upmanship between developers trying to make their BRUTAL MELEE EXECUTIONS more BRUTAL, more BADASS and more VISCERAL than anyone elses. You could easily track the advent of this not entirely tasteful trend back to Gears of Wars chainsaw bayonet, but you could just as easily, by going back a bit further, trace it back to Dooms chainsaw. Doom begat Gears of War. Gears of War begat an entire generation of arm-crunching, neck-snapping, close-range brutality. Pistol, shotgun, rapid-fire weapon, rocket launcher, ridiculous OTT weapon of insane destruction. Thats the sacrosanct weapon progression of the first and third-person shooter, and Doom got it locked down in 1993. There are myriad variants of each of these weapons in the shooter genre, but all are built around the same staunch and noble archetypes. Wolfenstein played around with pistols, multiple rapid fire options, and even a flamethrower, but Doom really got it right, coming up with a weapon-set that covered all tactical combat bases beautifully, with the potential to make the greatest deal of meaty mess yet seen in a video game. In fact its even arguable that Dooms iconic shotgun, with its equally iconic, omgitlooksreal reloading animation, actually popularised shotguns in video games in the first place. And where would we be without shotguns in video games? Still living in caves, thats where. So that's how the innocuous act of chainsawing a zombie in half turned out to be such an important turning point. But how do you feel about Doom, 25 years on? Add any important points you might have in the comments, and feel free to share your favourite memories of the game and the series as a whole.